With his "hoo-ahs" and "oo-rahs", Marine Corps Lt. Colonel Frank Slader (Al Pacino) sways his way in this “dramedy” about a blind man who is accompanied by a young student (Chris O'Donnell) on a grand last trip. Golden Globe winner Scent of a Woman was the American remake of Dino Risi's 1974 Italian film Profumo di donna (starring Vittorio Gassman), adapted by Bo Goldman from the novel Il buio e il miele by Giovanni Arpino. Pacino and O'Donnell starred with James Rebhorn, Philip Seymour Hoffman, and Gabrielle Anwar. 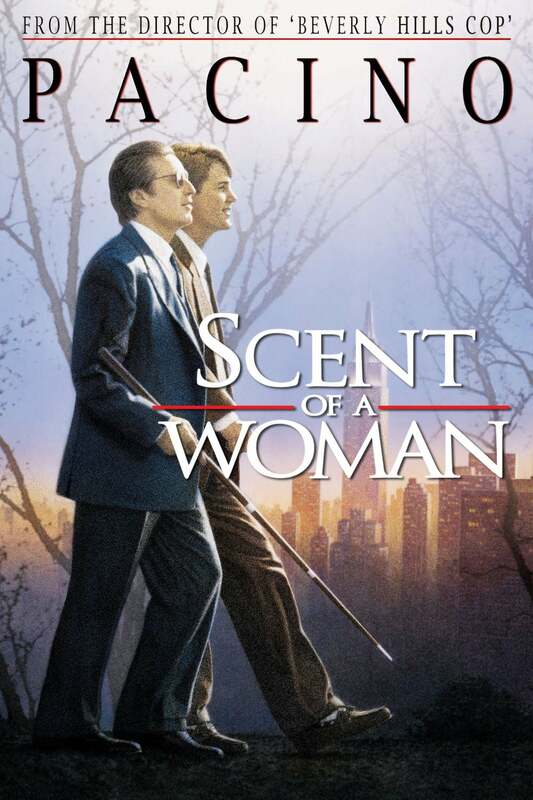 Scent of a Woman (directed by Martin Brest) received four Golden Globe nominations, winning three: Best Film–Drama, Best Actor– Drama (Pacino) and Best Script (Goldman). Pacino would win his only Academy Award for the role. As of today Pacino has had 17 Golden Globe nominations, winning four times (for both film and TV), and was the recipient of the Cecil B. deMille Award in 2001. In addition to winning the Best Actor Globe, that same year Pacino was nominated for Supporting Actor for Glengarry Glen Ross (Gene Hackman won for Unforgiven). The 50th Golden Globe Awards were held on Saturday January 23, 1993 at the Beverly Hilton Hotel. The other dramas nominated were: A Few Good Men, Unforgiven, The Crying Game and Howard's End. The Best Actor– Drama category was quite competitive: Pacino had to spar with Tom Cruise (A Few Good Men), Denzel Washington (Malcolm X), Jack Nicholson (Hoffa) and Robert Downey Jr. (Chaplin). In preparation for playing a blind man, Pacino found help at a school for the visually impaired. He said that he made himself appear blind by not allowing his eyes to focus on anything. He would often remain in character off set, using his cane to walk with and never looking at anyone when they talked to him. Young Philip Seymour Hoffman auditioned for his role in Scent of a Woman five times before he was cast. Hoffman was working various odd jobs at that time, including stocking shelves at a Manhattan deli before being cast. Hoffman said that this was the film that changed everything for his career. While Pacino's performance was universally praised, some criticized the film for its length. But Pacino, between a “hoo-ahs” and another, managed to make it entertaining, dragging the audience in his character's wild ride and last hurrah.